There are various ways to find your Facebook user ID number on internet. 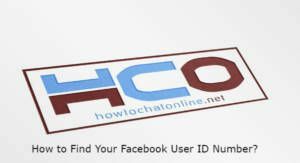 We are going to tell you how to find your User ID Number on this page, you can also get many more tips about Facebook on How to Chat Online. Please feel free to ask us anything about solutions we will provide below. We will gladly answer your questions as soon as possible. You can find some tips to find your Facebook user ID for each operating systems such as iOS, Windows, Mac and Android… You will need to use browser for all these steps. Go to the main website to find your ID. Click on your name which is located top menu of the Facebook. You will see the profile link in the address bar. Copy it and go to findmyfbid.com again. Paste your profile link into the field. Click on “Find Numeric ID” button. You will see the numeric ID in the result. Download Google Chrome if you don’t have it on your device. Hit F12 on your keyboard to open page source. Then hit CTRL+F to open search field. Paste it on the search field and hit enter. You will see your Facebook ID instead of xxxx as we have given as example. These are ways that you can find your ID on Facebook. You can also share your knowledge with other users if you know any alternative ways. You can ask questions via commenting too.